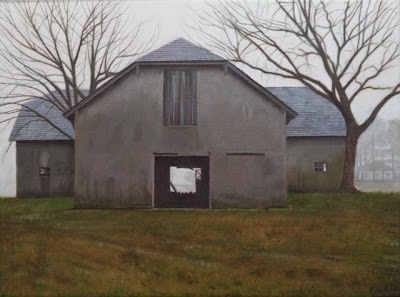 This is a painting of a remarkable old barn in an area of Midlothian that is being developed rapidly, which means this beautiful specimen probably won't be around for long. It is already to a large extent abandoned and is showing signs of neglect. There are several interesting aspects to this barn. First of all, in an area where Gambrel style barns prevail, the distinct architecture of this barn really stands out. Secondly, the exterior is finished in stucco which is extremely unusual. And lastly, the roof is slate which is probably the most expensive roofing material that could be used. I have no way of knowing how old this barn is, but with a little care, it probably could last another 100 years. This is a small painting (9"x12") and is typical of what I'm working on now- small studies that allow me to work through painting ideas rapidly.